Last night, I dreamt of my favorite White Mountains stream. It rises deep in the Pemigewasset Wilderness and is chock full of native brook trout. 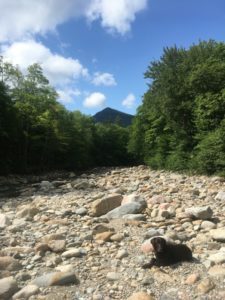 Like most White Mountains streams, it has high-gradient, small, and deep pools and heavily-weathered granite boulders. Similarly, its inhabitants run on the smaller side. 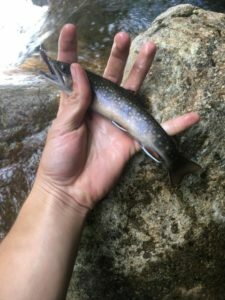 Despite their small size, brook trout are a delight to fish for. They hit dry flies with reckless abandon and put up spirited fights. Much like how it played out in real life, my buddy Colby joined me and we caught many fish. One pool in particular recurred in my dream. It has a long ledge along its left bank, a huge boulder on its right, and a fast cascade rushing through the middle. We caught some of the large (eight to ten inches.) fish there. 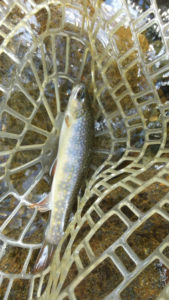 I stood on the ledge and fished, quickly catching one brook trout. Colby fished from the opposite bank. Suddenly, he slipped and fell face first into the stream. Before he regained his balance, I saw a massive shape dart under the boulder. We crossed the king of the stream and he passed three to four lbs.! The king is a grizzled veteran. He’s endured many summers and winters throughout his lifetime. As a result, he knows the stream better than any: every rock, every lie, and every lurking shadow. Some fishermen may see him, but, even fewer have caught him. My buddy Pete hooked him twice and both times he got away. Even in my dreams, he proved a tough customer. In every other stream, he is a normal, albeit decent fish. In the headwaters, he is a king among men. Fly fishing has crept back into my mind with the recent warm spell. I don’t usually get out much in the winter due to cold water and iced guides. Some anglers live for the winter, but, it’s not my cup of tea. With the weather projected in the 60s later this week, I may try to get on the board for 2018. It’s funny, but, I also dream of fly fishing. In fact, when I was 10, I had a recurring dream about sight fishing. It was during a very tough period in my life. I had no clue then about fly fishing or what was possible. So, when I fly fish, there’s just a lot going on in terms of “wish fulfillment” and dreams coming true. Thanks Jo! Fly fishing is very spiritual for me as well. Once in a while I wake myself out of a sound sleep dreaming I am lifting up my right arm to connect to a trout. Warm weather is just around the corner. We have made it through winter. High 40’s beckoned me to the lower Swift today, but nothing doing. A fellow angler and high school friend of mine connected with a nice rainbow on a big stonefly in a deep backwater pocket, probably 5 feet deep. Perfect place for a trout to be hanging out with water being as cold as it is. I drifted every fly under the sun today, and lost plenty plying wood pile areas and trees that had fallen in. No dice, but still nice to be out. Ended the day with a top water fly, elk hair caddis by chance I might get lucky. Sam, sounds like a great day, regardless. I went to the Farmington and was blanked. Many anglers were out, and I saw only one angler with fish. River was high, but, it was great to see so much water, with the hopes that we avoid a drought this summer.